After the orange marigolds in my window box wilted during a surprisingly sweltering spring day, I replaced them with purple calibrachoa flowers and have been doing my best not to let them go thirsty. Considering how much water I drink, you think I'd remember to share with the flowers more often! At least the newest flower in my jewelry collection doesn't need to be watered to survive. 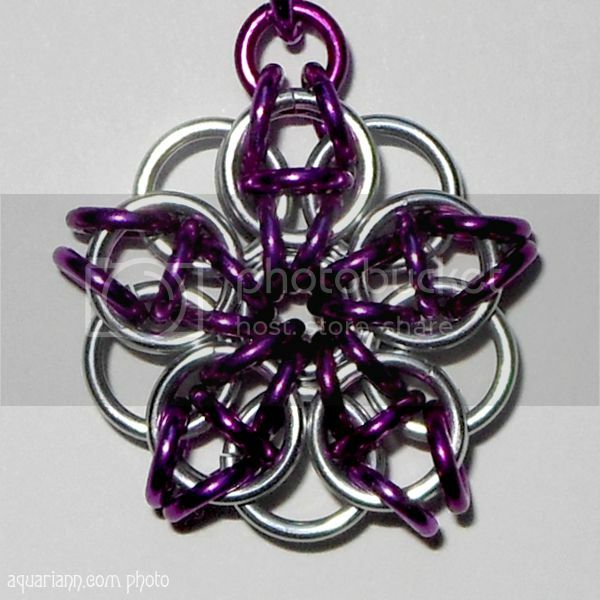 Jennifer of WXdruid Chainmail grew the chainmaille flower pendant above by interlocking silver and fuchsia jump rings. Wearing the handmade necklace in sunlight helps the anodized aluminum shine even brighter. So very cute! Thanks for the feature and mention, glad you love the pendant! How can you kill marigolds? Oh, Kristin, what are you like? I wish you better luck with the calibrachoas! I love them but they're rarely seen over here in Ireland. We tend to go for their bigger cousin the petunia (and they do need constant watering). The calibrachoas have a much wider colour range and are less susceptible to the dreaded aphid. Maybe I'll start a trend! Ha ha! Try some negative psychology on them, you know like "die & I'll kill you"! Works for me! Very cool! I never thought of using chainmail like that. Can't wait to see pics of your calibrachoas! I love chainmaille work. This is a really cool pendant!